James Karagiannis, known as the Ice Creamcycle Dude, is not a typical ice cream peddler. 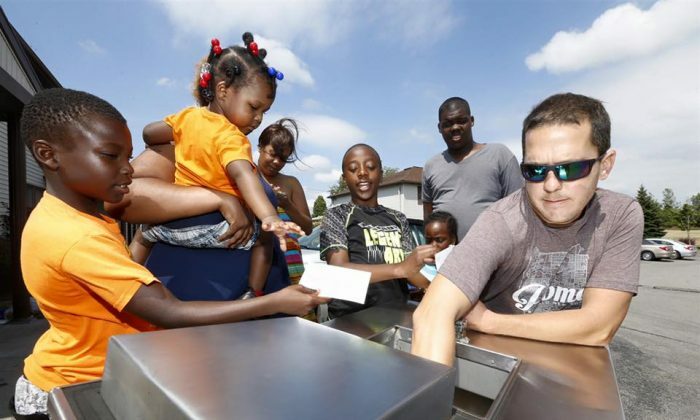 Karagiannis, 36, recently started a pay-it-forward campaign to bring free ice cream and frozen treats to kids in disadvantaged neighborhoods in Buffalo, New York. He’s been circulating around the neighborhoods about nine years, and according to the Buffalo native, sometimes his job can be a little bit tough. “One of the hardest parts about being an ice cream dude is seeing the disappointment on a kids [sic] face when all of their friends buy ice cream but they’re left out because they don’t have a dollar,” Karagiannis wrote on his Facebook page. Karagiannis, who has a team of eight that helps distribute the treats, say they could never say “no” to the kids. He said he wouldn’t make them pay with money, but they were often quizzed in exchange for an ice cream bar. “We’re in these neighborhoods everyday and are a part of these kids lives, therefore we have the responsibility to be positive role models,” he wrote on Facebook. In the end, Karagiannis’s generosity took a toll on him financially, so he launched the pay-it-forward program. So far, he told Epoch Times, he has raised a total of $7,000. Karagiannis is now able to give children in the community free ice cream. The children, in return, must hand write thank you letters to their benefactors. April’s ‘Full Pink Moon’ to Appear Early on Good Friday Morning–Don’t Miss It!